A pack of Texas Democratic challengers out-raised Republican incumbents in Congress. Now they've got to figure out how to wrestle away districts where, in most cases, Republicans win with ease. Democratic challengers outraised Republican congressional incumbents in seven races in Texas during the second quarter of the year. But in most of those races — including the statewide contest for U.S. Senate — recent election history favors the Republicans. Sometimes, it favors them by a wide margin. Money helps. A challenger to an incumbent has to become known to voters to have a chance, and some sort of advertising — door hangers, radio and TV advertising, social media ads — is a big part of that. An expensive part. So don’t discount the importance of money, or the boost that a challenger gets by out-raising a better-known incumbent. But don’t ignore the political atmosphere, either. These are, for the most part, Republican districts. 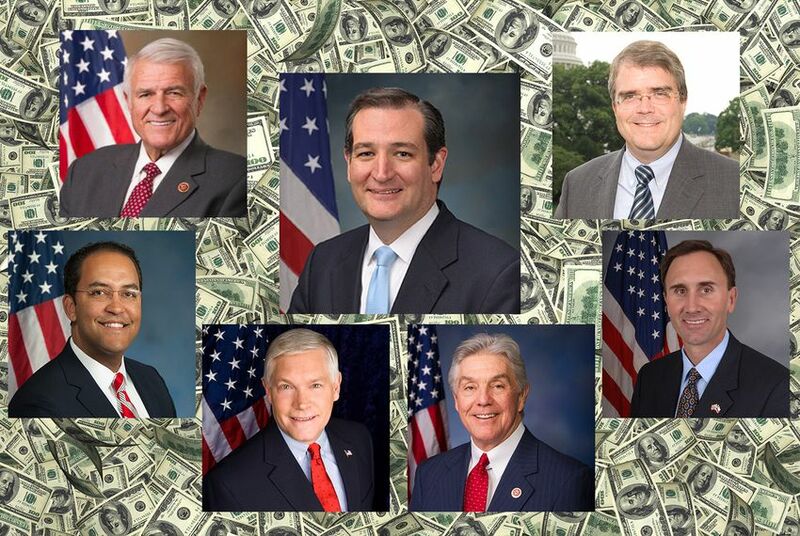 Seven Republican incumbents in the Texas congressional delegation were outraised by their Democratic challengers in the second quarter of 2018: U.S. Sen. Ted Cruz and U.S. Reps. John Carter of Round Rock, John Culberson of Houston, Will Hurd of Helotes, Pete Olson of Sugar Land, Pete Sessions of Dallas and Roger Williams of Austin. They were outdone by some Democratic names that, for now, are a little less well known: Beto O'Rourke of El Paso, MJ Hegar of Round Rock, Lizzie Pannill Fletcher of Houston, Gina Ortiz Jones of San Antonio, Sri Preston Kulkarni of Houston, Colin Allred of Dallas and Julie Oliver of Austin. Cruz’s race against O’Rourke is this year’s marquee event. It’s the top race on the ballot, and the contest for governor that might contend with it for public attention looks considerably less competitive. Cruz has run only one statewide general election —for Senate in 2012 — but was on the presidential ballot in 2016 before losing the Republican nomination to Donald Trump. He’s better known than all but a handful of Texas Republicans — a significant advantage over the Democrat — but he has also raised less money. That’s got people who don’t usually pay attention to these things paying attention; in a Texas where Republicans regularly beat Democrats by double-digit margins, recent polls have this contest in single digits. The question being answered in November is a biennial one: Can a Democrat beat a Republican in a statewide race in Texas? For more than 20 years, the answer has been a consistent “no.” But the financial results to date — the candidate nicknamed Beto has outraised the candidate nicknamed Ted in all but one of the reports filed so far — has made “maybe” one of the possible answers. Democrats in Texas do better in years when presidential races are on the ballot. Turnout is heavier — those national contests are more interesting to more people — and the margins tighten in statewide races. The average Republican margin of victory in 2014 — the last gubernatorial year — was 22.4 percentage points. In 2016, it was a smaller but still substantial 14.1 percentage points. In the six congressional districts where Democrats outshone Republicans in second-quarter fundraising, only one — the 23rd — has been competitive in recent elections. Hurd won by a hair (1.3 percentage points) in 2016 after successfully challenging a Democratic incumbent two years earlier in an election he won by a relative landslide of 2.1 percentage points. He’ll face Democrat Gina Ortiz Jones in November. Sessions didn’t have a Democratic opponent two years ago; in 2014, he finished 26 percentage points ahead of the Democratic candidate. The other four seats are — at least in recent elections — testaments to a very effectively drawn political map: Each of the incumbents won easily in 2016: Culberson by 12 percentage points, Williams by 20, Olsen by 19 and Carter by 21. Trump’s finish in some of those districts is encouraging to Democrats. He lost to Hillary Clinton in Culberson’s Houston district, in Hurd’s border district and in Sessions’ Dallas district. His political misfortunes weren’t enough to sink the people right behind him on the ballot, however, and he won’t be at the top of the ticket this year, anyhow. Instead, the congressional candidates from both major parties will be watching the U.S. Senate race between Cruz and O’Rourke, hoping one of the two candidates directly above them on the ballot gets voters going in their direction. Fundraising in these races during this most recent quarter went to the Democrats. Mark that as a hurdle overcome. November is the bigger obstacle.